Informationj signs at the historic locations along this walk bring this tiny town's past to life. 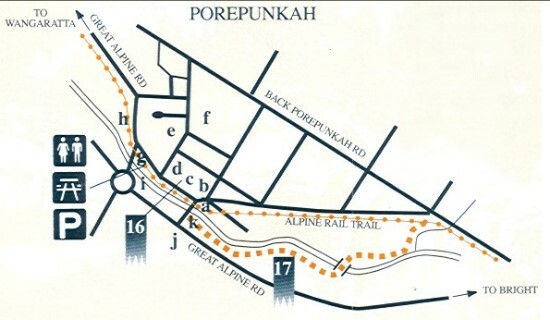 In the mid 1800s it was thought Porepunkah would become the district centre. a - Site of henderson's Mill Port House, a popular tourist guest house in the early to mid 1900s. b - Porepunkah Hotel, built from locally made sundried bricks. c - Site of Blacksmiths Shop. f - Tewksbury's Dredge began work on this site in 1901.
k - Site of Russell's Temperance Hotel, noted for its fine terraced gardens.